Could you resist something called Melting moments? I absolutely, definitely, positively couldn't. And I'm glad. These cookies have conquered my family, my friends and everyone who's ever tried them. I'd like to give some credit to a book "Biscotti", from a Cordon Blue series, where this recipe comes from. I've tried several other recipes from this book, but neither was this good, and rarely made any of them twice. I have transformed the basic recipe into 4 different forms, so now everybody's happy, my husband included. Because I dared making them with jam only, once, and he was shaking his finger at me, "You weren't thinking about me." I was supposed to know that he'd eat only the Nutella filled ones. Now before I proceed, I need to thank Shane from Culinary Alchemy, because it was reading his recipe, Berry White in a cookie, that I finally realised how to add Nutella to the center of my Melting Moments cookies. It was something I wanted to do for such a long time, because I had had similar cookies, but just couldn't figure it out for myself. Place butter, sugar and the finely grated lemon zest in a mixing bowl, and either beat with an electric mixer or with a wooden spoon until light and fluffy. Add the yolks and continue mixing. Add flour and mix everything quickly. Do not work the dough much, as the butter will start melting. Place your pastry bag in a tall glass (please don't use plastic bags, as they'll break) and fill with the dough (not more than half of the bag). Holding the pastry bag with both your hands form cookies like in this picture: swirls for bottom cookies and rings for top ones (line your baking tin with baking paper). It will be rather hard to squeeze the dough out, but after the first one or two cookies it will be much easier, so don't give up. Bake in an oven preheated to 180°C for 10-12 minutes, until slightly golden. Let them cool for a minute or two and then place on several layers of kitchen paper that will absord extra fat, and leave to cool completely.When all cookies are baked and cold you can fill them raspberry jam (I recommend it) or Nutella (Gaetano recommends it). But the story doesn't finish here. Take some dough apart and add 1 tablespoon Nutella, mix well. With the original dough make rings as described before. When you have finished, fill the pastry bag with the Nutella dough and make little "roses" in the middle. Bake in the same way as described previously. I was saving the best part for the end. 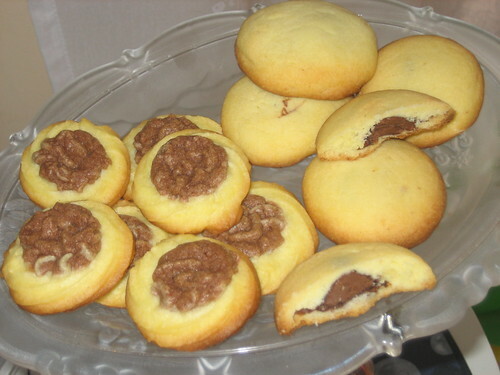 To make Melting moments with Nutella center, you need to start about two hours before you start baking actually. Chill Nutella in the fridge for a couple hours. Then scoop little balls and place them on a tray covered with plastic wrap, or if you have a silicone mould like mine, use that, and leave in the freezer for 2 hours. Take a teaspoonfull of dough, form a ball and then flatten it, place nutella ball in the middle and then close the dough all around it. It won't be difficult as the dough is very soft. Bake as before. I recommend not to make your cookies too big (mine were about 5 cm in diameter). What can I say, do not melt before your Melting Moments melt in your mouth!!! Stavite maslac sa šećerom i limunovom koricom u zdjelu i miješajte mikserom dok ne postane pjenast. Dodajte žumanjke i miješajte da se sve sjedini, a onda dodajte brašno i izmiješajte dobro drvenom ili plastičnom žlicom. Stavite platnenu vrećicu za ukrašavanje u visoku čašu pa je napunite smjesom do polovice. Uvrnite vrh vrećice tako da potisnete tijesto dolje, a potom preklopite rub. Držeći vrećicu s obje ruke oblikujte kekse kao na slikama gore. Prva dva će vjerojatno biti prilično teško istisnuti, ali onda se tijesto počne zagrijavati u rukama i bit će puno lakše. Možete također dodati 1 žlicu nutelle u manji dio tijesto pa našpricati ružice usred prstenova da dobijete dvobojne kekse.Pecite u pećnici zagrijanoj na 180°, C 10-12 minuta, trebaju ostati svijetli. Spojite kekse tako da na puni krug stavite žličicu pekmeza ili Nutelle i onda preklopite prstenom. Još jedan način da pripremite ove kekse, ako ste strasni ljubitelji Nutelle kao ja, je da rashladite Nutellu u hladnjaku nekoliko sati, potom žličicom napravite kuglice i stavite ih zamrzivač 2 sata. Potom uzmite tijesto (u veličini oraha), najprije napravite kuglicu, potom je stisnite na dlanu, stavite lopticu nutelle u sredinu i oblikujte ponovno kuglicu, pecite kao i ostale. Za prste polizati. Con uno sbattitore elettrico o con un cucchiaio di legno lavorate il burro con lo zucchero a velo e la scorza di limone in una crema soffice e leggera. Incorporate i tuorli, unite la farina e lavorate finché sarà tutto ben amalgamato in un impasto morbido. Trasferitelo in una tasca da pasticcere con beccuccio a stella di 8 mm. Su una piastra foderata con la carta da forno formate delle rosette e degli anelli. Potete anche prendere una parte dell'impasto e aggiungerci 1 cucchiaio di Nutella, e poi riempire i vostri anelli per ottenere dei biscotti bicolore. Cuocere per 10-12 minuti a 180°C. Lasciate raffreddare i biscotti sulla carta da cucina. Dividete i biscotti in coppie, spalmate di marmelata o Nutella sulla parte piatta della rosetta e coprite con un anello. La variante dei stessi biscotti per i più golosi: raffreddate la Nutella in frigo per un paio di ore. Poi formate delle palline e mettetele nel freezer per 2 ore. Prendete un cucchiaino di impasto, formate prima una pallina e poi appiattitela con la mano, mettete la pallina di Nutella al centro e chiudette formando una pallina. Cuocete i biscotti come prima. Oh wow, those look fantastic! I love Nutella. They look scrumptious! I'd go for the Nutella ones, too! Yummmm! I have to warn you, these are addictive, I haven't made any other cookies for months now. Another nutella cookie! Dare I try it??? They'd be gone in no time at my house!